This prayer known as the Hail Mary or Ave Maria incorporates the greetings given Mary from the Angel Gabriel and Elizabeth. “And he [Gabriel] came to her and said, “Greetings, favored one! The Lord is with you” (Luke 1:28). “And Elizabeth … exclaimed with a loud cry, ‘Blessed are you among women, and blessed is the fruit of your womb’” (Luke 1:42). 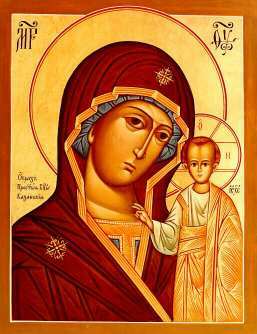 Since the Council of Ephesus in 431 Mary has been known as “Theotokos,” the Mother of God or God-bearer. Thanks Father Mike for putting this video on your site. I just got done translating seven Anaophras (Eucharistic prayers) from Syriac to English that have never been published before. They are so beautiful… much like this hymn. Could it be that the world is discovering this lost Christian tradition that has been hidden behind the veil of Islam for 1400 years? Father Barhanna I am glad you like the video. That hymn is beautiful and speaks to the soul – deep calling deep. The Syriac fathers, their hymns, and writings need to be recovered and made more accessible. They have much to teach us. i hope you might consider posting your translations on your blog. Advent blessings to you and your parish.